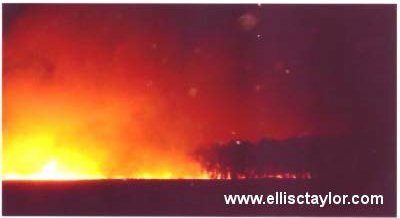 After having spent two years or so living in the Bush I returned to Perth in 1995 and moved into a house in the suburb of Viveash, near the Swan River. In the garage the previous owners had left an assortment of items, among them was an unusual spear. It was barbed, carved and pyrographically patterned, and even though it had been broken at the end it was at least 7 feet long. It was clearly ancient. This was no ordinary inheritance. I knew in the heart of me, without knowing why, that I was now, in some mysterious way, not the owner, but rather the custodian of something quite extraordinary. During my time living on the borderlands of the desert, east of Perth, I had become close friends with the native Nyungar people who lived there and I was fortunate enough to spend countless fascinating hours listening to their stories and learning about their culture. Inevitably I did wonder whether to pass the spear to them, but strangely this didn’t feel right. It was for someone else, but who? I did not know. With and about the mysterious missile I felt a strange and latent power; not dulled, not even deep; more like a Manhattan bride waiting for its moment. I knew not to bother it, not that it would awaken for me but it stood like a silent, still shivering sentinel in my office keeping watch…waiting. And I wonder, did the spear play a part in keeping me and those around me safe in some quite precarious situations? Shortly after acquiring the spear I had two very vivid recollections of past lives that may be appropriate. The first was through a Medium that I had been introduced to. I first met Mrs Andrews when I was taken to a packed evening session she was holding close to Charles Gairdner Hospital. Forming a sizeable number of the audience were several doctors, surgeons and nurses. In everyday life Mrs Andrews was a farmer’s wife while in her other capacity the lady had built a formidable reputation as an extremely accurate channel for previously incarnated health professionals, scientists and other white-coat bods. The medical and scientific intricacies were way beyond my ken but I was told by well-heeled and credential-ed attendees that the detailed knowledge and advice she brought through was of the highest order. The following week I drove to the Andrews’ farm for a personal consultation. At one point during the session Mrs Andrews began describing a previous life of mine as a newly-arrived young priest on an island. It was in the late 1700s, from memory. (I have the recording, but not with me at the moment.) I began to see what she was relating, as she told me – I could see what she was seeing. The island was inhabited by a dark-skinned native people who were being abominably mistreated by a religious order that were governing the island. Deemed by the cruel authority to be sub-human the people were kept half-starved and worked hard from dawn till dusk before they were locked away under guard in their huts a little distance from the clerical stronghold. I refused to comply with the brutal treatment wrought upon these poor souls and did all that I could to alleviate their distress. At night I would slip out of the compound and along the track to take them food and anything else I could find that they might need. In time I gained their trust and took every opportunity I could to communicate as best I could with them. It wasn’t long before they confided, to my increased horror, that their children were being molested; and in my naïveté I wrote a letter to the bishop detailing the abuse these tormented people were suffering. I met my end one dark night while returning along the path to my quarters, when I was bludgeoned to death. In 2005 I returned to live in the UK leaving the spear in a safe place. It is now May 2013 and I am back in Perth. I originally planned to visit Oz in September – if I could get the money together – but everything fell into place for me to alter my schedule and I fronted up in the City of Lights four or five months earlier. I went to spend time with my mum… and for some reason my trip had been manoeuvred forward. I wondered what awaited. After the usual harrassment I endure at airports, my first visit was to a care home for the elderly; and there I met an aboriginal man in his 80s, a resident there. I’ll call him Richard. Richard has a soul-beautiful; a deep wisdom and serenity gleams about him. Sadly, he is physically incapacitated and unable to hold a verbal conversation, although he can, with huge effort, say a few difficult-to-comprehend words at a time. His legs stubbornly inactive, his hands and arms feeble. Richard gets around the grounds in a wheel-chair but these physiculties, these bitter chains of the material world, however, I realised from the off, had no authority over this remarkable being. At times I was sure that he was reading my thoughts…and I his. I told her how I knew them and about our friendship. Her answer was, “There are no coincidences. We were destined to meet. You are here for more than you think…” and staring right into my eyes she continued…”and it is very important!” I told her that I suspected as a much. We talked some more. As we spoke I became aware of a warrior standing behind her; white streaks striped his scarred black body; thin bones pierced his ears and his arms. He carried no weapons and he didn’t speak. He just stood there, making his presence known; but he looked somewhat lost, distracted; between worlds you could say. Christine told me how almost everything people think they know about the Nyungars and their history and culture is wrong. “Our people have been misguided and misinformed. Our lore is sacred, and it is secret…always been that way. It is our Dreaming. It has only ever been passed down orally, and only to those who are chosen to carry it. Not everyone can; we each have our role. This is the calling and the duty of the magic men and women. It is a destiny. He or she is born for it and from childhood taken under the wing of those who come before. It takes long years of training, practice, and experience. She briefly fell silent as she gazed in the direction of her slumbering father before returning her attention to me. Christine told me that Richard, although a Nyungar, was bought up by the Wongai, a people who hail from the east of Nyungar tribal lands; a desert people who my friends in the Bush had told me were ancient foes of the Nyungars. Richard had been noticed when he was very little by the magic men of the Wongai and given special and secret initiation and tuition. “That old fella…”, she nodded towards Richard “…is a Featherfoot.” – a ‘Boylyada maaman’, a Cadiche man (a magic man, a shaman…but more than these). A Featherfoot is an avenger too, when necessary. Known about, respected and feared by every native Australian. A Featherfoot, when about their business bi-locates. At the same time they are witnessed, in physical form, in more than one place, and the targeted miscreant never hears them coming because they wear feathers on their feet. Christine says that there are only four left in the whole of Australia. Richard is Coryol (king). Christine related a story about when she was 13-years-old: One day she had to travel alone to an event in Claremont (a suburb of Perth, several miles away), by train. On her way home it was dark when the train pulled into Midland station. From there she had to walk a mile or so. As she made her way along the lonely road a car carrying a group of white men drew up beside her and the occupants started calling for her to get into the car. Christine walked faster and the car sped up to her. One of the men jumped out and made a grab for her…suddenly he froze! His face turned ashen, horrified. He fell against the car and began to scream to his companions to open the door; barely inside it the car screeched away. “Is that because of the male/female thing, mens’ business, womens’ business?” I asked. 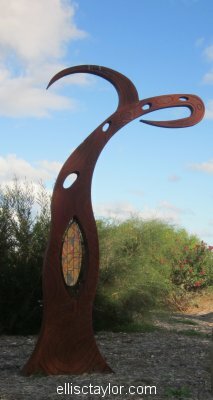 On my way home the gidgee (the spear) whistled into my mind. ‘Pass it to her,’ came the words like a drumbeat. Arriving back home I related what had happened at the care home and went to look for the spear; but it wasn’t where I had left it. I asked the person that I’m staying with where it was. “Remember what?” says Mr Forgetful. Back in July last year (2012) we were visiting a Medium friend in Wales when a distinct change in the atmosphere occurred. “I have a man here,” the Medium said… and I could see him! Before me, in spirit, standing composed and respectful, was a warrior, very black, and quite heavily set; tallish for a Nyungar. He had scars and skin markings. “He says that you have something of his and that he would like it back,” said the Medium. “The spear!” we both said. “He can have it. I’ve been looking after it.” I said. “I will put it outside when I return to Australia,” said my companion. A few days later Christine came to visit her dad at the same time I was there. The next day Christine arrived. After speaking with her father she came over and said that yes, they would love to accept the spear. I drove home to get it. My mere words are pitifully inept when it comes to describing the intensity of the waves and feelings that rushed around, about, and through where we stood. Richard cradled the spear in both hands and in a hushed voice he said clearly and pointing precisely in that direction, “It is from up north”. “Up there… It’s Nyungar.” He patted the shaft gently, his eyes welled; ancient tears spilled upon his weather-worn cheeks as he grasped for my hand…”Thank you, thank you, thank you.” Goosebumps erupted on my skin, my heart sang… and I wept too; tears no less ancient; a proud Featherfoot and a boy with memories of a cliff top long ago in a time before this one. I felt so humbled and grateful to have been chosen to be a part of something that had meant so very much to him. It seems the spear has woken up! It is back home. Richard passed to the otherworld the week after I left Australia, at the beginning of June. * Yagan, some reading this may know, was a famous Nyungar hero and warrior who is still talked about in awed reverence by Aboriginals throughout Australia; no less so than William Wallace is, by the Scots. …and I’ve only just now found out that Yagan, according to official history, was shot and killed in a place not far from where I am writing this. It’s actually a place that has resolutely drawn my attention, called me, whenever I have passed by it. I had no idea of its significance. The last time I was there it was just an undulating riverside meadow, but now it is being developed into a memorial park to Yagan. Using George Fletcher Moore’s interactions with Yagan and his account of Yagan’s death, this page explores Moore’s attitudes to the Aboriginal people. It also considers the complexities of Moore’s character as revealed by his letters to the Perth Gazette, where he used the pseudonym ‘Philaleth’. Yagan, according to the official narrative, died on 11th July 1833. It is probably right too; the Numerosymbology supports it. The story is that Yagan was decapitatated after he was killed and his head shipped to England. A campaign was launched to have the head returned in recent years. There was a great deal of infighting but eventually a head was sent back. Trouble is Nyungar visionaries dispute that Yagan ever lost his head because they say his spirit has returned and shown them he still has it. This entry was posted in Ancient, Ceremony, Ellis Taylor, Journeys, Mystical, Occult, Otherworlds, Protection and tagged Australia, Featherfoot, Nyungar, Spear, warrior, William Wallace, Wongai. Bookmark the permalink. Welcome back Ellis. Nice looking site mate. Thanks Steve, and thank you to for your much-needed pointers and continued support over the years. I see you’ve done up your site too. It’s looking fabulous! Ta mate, much appreciated. Speak soon. Thanks Sam, glad you enjoyed it. Thanks for commenting mate. Appreciated. My sisters’ son is also Yagan. As I read the story at the beginning I knew you were going to say it was him. He will return in due time to protect and guide his people. I wonder why the place is called Viveash? Sorry to take so long responding Caramon. Interesting. He will. Viveash is named after some bloke, can’t remember who off-hand. Thanks for the comment. Thank you for saying so Kyel.